This time of year I'm always tracking down holiday palettes to review, and this one from Hard Candy is one of the most affordable I've found. 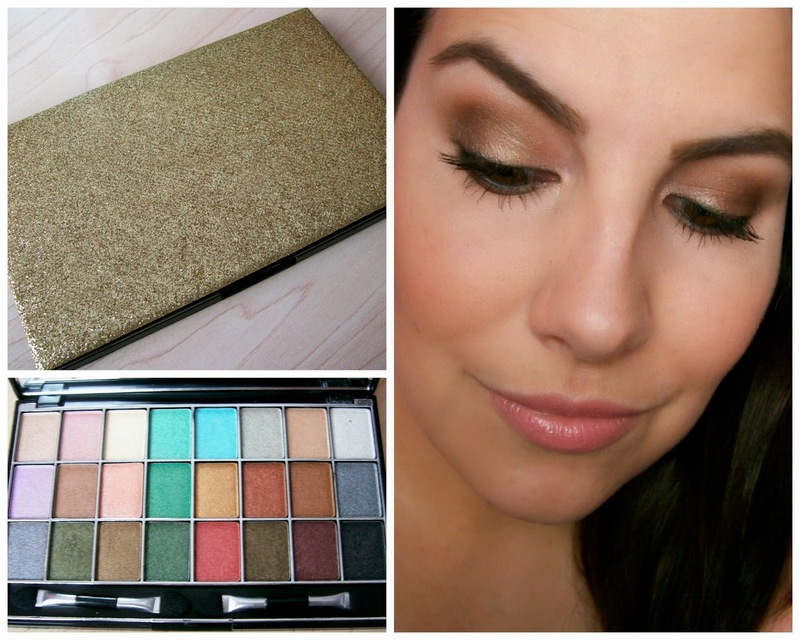 It's called the Glam Kit Eyeshadow palette (24 colors), and it was only $4.88 at Wal-Mart. 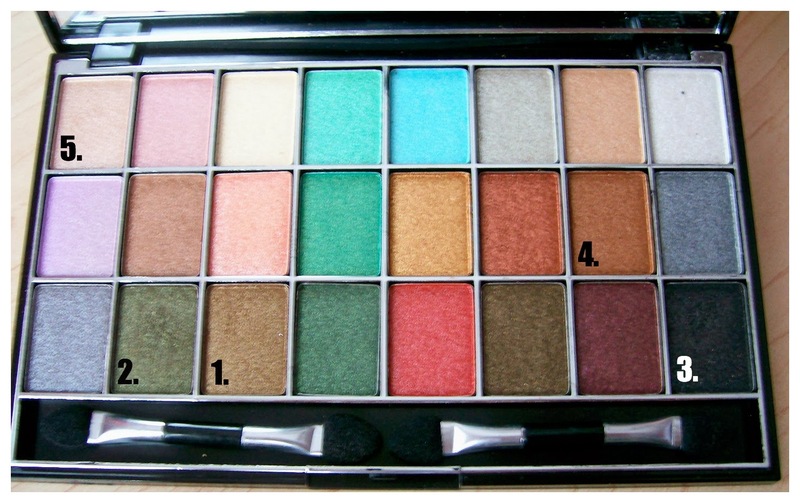 There were actually several versions of this palette available- maybe 4 or 5 different options. They had different colors on the top of the palette (I chose the gold one), and each had its own grouping of shadows on the inside... each one seemed to have quite a bit of color variety, and they all contained shimmery shadows. Ever since I fell in love with the quality of Hard Candy's baked shadow duos, I've been intrigued by any subsequent shadow release because I'm just hoping that it's the same as those duos. So far nothing measures up, including this palette. Here I've swatched the top, middle, and bottom rows of this palette and didn't use any primer underneath. As you can see- the pigmentation is VERY weak with that top row. When you look at the center row of the palette, you'd think those shades should be pretty vibrant... they swatched better than the top row, but are still pretty sheer. 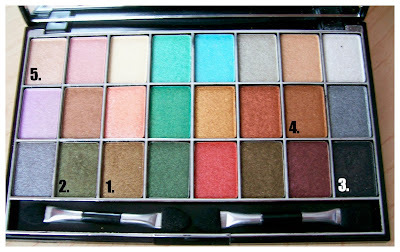 The bottom row contains the deepest shades, and also some of the most pigmented shades. (I used a couple of the best shades from that row in my look today). Still, the quality is very hit and miss-- note the swatch of the black shade... it looks like a sheer grey. As far as other parts of the look, I lined my upper lashline with the Jordana 12 Hr. Made to Last eyeliner in Jade Jewel on my upper lashline, and I used a black pencil in my lower waterline. I also applied mascara to my upper and lower lashes. On my lips, I'm wearing the Maybelline Color Whisper in Petal Rebel with Laura Geller Color Drenched Lip Gloss in Tea Rose on top. Overall, I'm pretty pleased with the shadow look- partially because I used some of the more pigmented shadows in this palette. One thing that I was not happy with was the black shade. I had to really scrub on the shadow with my brush to pick up any color, and then when I started to apply it, it had really bad fall-out on my cheek... you'd think that a shadow that creates fallout would at least be rich and pigmented, but that wasn't the case here. It was weird! I had to wipe down my cheek and start over with my concealer, which I almost never do. It started snowing here yesterday afternoon and it hasn't stopped! This is nuts! I have a new video going up tomorrow on my main channel- it includes some drugstore DIY beauty gift ideas. I'm very excited about it!! I SO enjoyed The Sound of Music last night! Those songs are so classic, Carrie Underwood was amazing, and the kids were adorable. Also- from the live TV standpoint... it really didn't seem like anyone missed a beat- from the performers to the camera shots- everything seemed so solid! My feet are so dry. Not cute. A tractor just came by to scoop our street! yay! Im in Evansville IN and it is still coming down here too! So much cabin fever lol. Hope Hard Candy reads your blog and fixes those shadows! I am so glad that you found those, I had been looking for them and wondered if it as worth buying.... I have many Hard Candy products and have been pleased so far. Its hard sometimes seeing colors and thinking they will be very pigmented. At least now I know I will not be purchasing it even though its only $4.88. 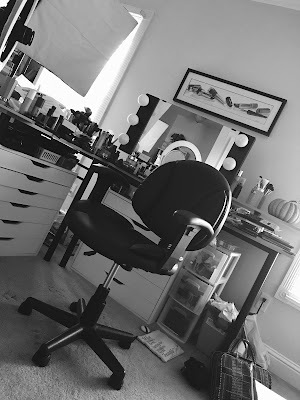 Its hard to makeup reviews myself when some product lines have a few hits and misses. I am just glad I have never had to really say that one product line is a total miss though. I appreciate your honesty and sharing with us. I have enjoyed watching you this past year and you have such a cute personality. Thank you for your time and energy in doing these reviews. Have a Merry Christmas, Beautiful!! This looks like a good, affordable choice for my little girl who loves to play with makeup and dress up. Can't beat a $5 palette for a stocking stuffer for a 4 year old! Hi Emily, BTW have you ever tried Merle Norman Cosmetics?? I use to work for them well over 10 years and grew up using their products...They have some really great products to try and use. 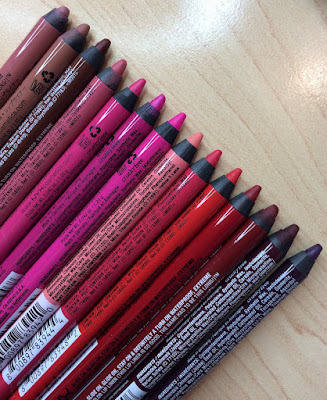 I would love to see you do a review on them especially their Lip Pencil Plus's ...its a lip pencil with liner on one and lipstick on the other. These work and stay so well and around $16.I just feel sometimes they do not get enough recognition for some of their great products....anyway, I just wanted to suggest that line to you to try. Their policy is TRY BEFORE YOU BUY....a great one if you ask me they give great samples. Gorgeous colors! Thank you for sharing this review! I wish they were more pigmented, but some of the shades look great! 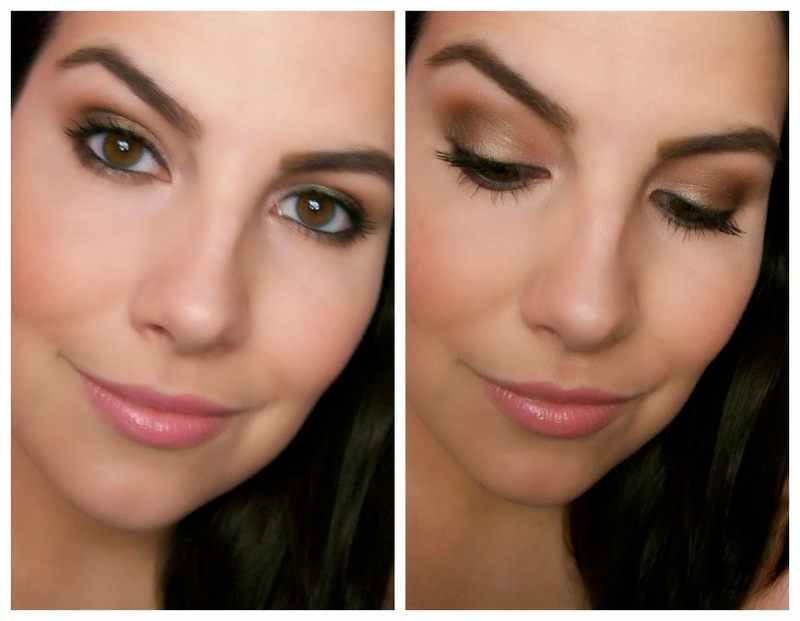 Beautiful makeup look and I love that eyeshadow palette. I love the eye look you created ! Your look is blended wonderfully! Thanks so much for your continued reviews of drug store finds!! Thanks for the review, Em! Great review. I've been eyeing Hard Candy more now that I saw your liking of the baked duos so I'm glad to know this because I love grabbing the palettes for more color choices since I never use an entire eyeshadow it seems. Love the look you did! I love these colors! They look amazing on you! This looked so promising... 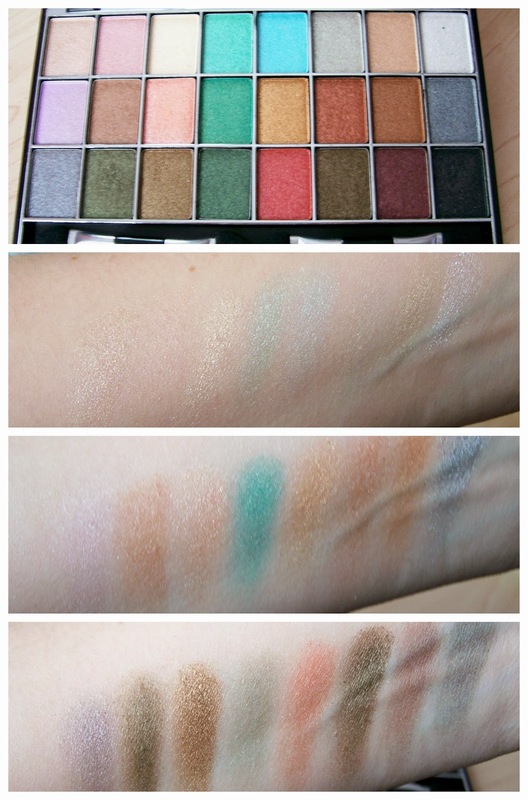 I normally love Hard Candy products although I haven't tried any of their eyeshadows yet. Great review, I love the eyeshadow look on you. Uh oh. I just bought this palette from my Walmart yesterday. Good thing I read your review first; it will be returning back to the store as I haven't tried it out yet. I am a religious follower of yours...so your review is like written in stone for me :D. final say is yours. I actually picked up the black pallet like this. I really love how you corresponded the colors together. I would like to know what kind of brushes you use. doesn't have to be brand but type. I'm determined to learn how to do this kind of look on my own. At 25 I'm embarrassed to say I haven't known already lol but wouldn't have thought of using these colors together. New Revlon Finds at Ulta!